Keyless entry systems are quickly replacing traditional, key-based locks at commercial properties such as retail stores, professional offices, warehouses, and hotels thanks to the fact that electronic door access devices eliminate many of the concerns that come with using mechanical keys. 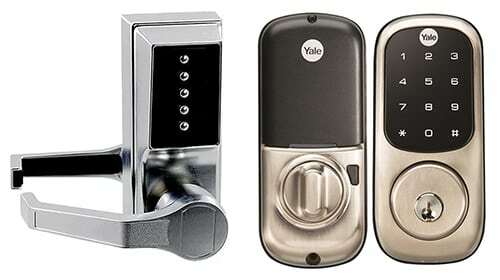 Analog and electronic keypad locks and deadbolts are great Access Control options for commercial property doors. If you are still using traditional keyed deadbolts and locks at your business, you need to be aware of the security risks that come with lost keys, keys that are copied without your permission, or even disgruntled employees who leave your company without returning their keys. In these situations, the only way to know your building is secure is to have all of your locks either rekeyed or replaced, which is both time-consuming and costly. With a keyless access control system, mechanical keys are replaced with keyless door entry systems such as card readers, a coded keypad, or even a fingerprint lock that completely eliminates the risk of lost access cards and forgotten codes. These devices are all controlled by the system administrator through secure software that can be programmed to allow specific employees access to particular areas of your facility based on your operational requirements. While every wireless security system is unique, each one usually needs to include at least one magnetic lock, or maglock, that keeps the door locked with a powerful magnet. This magnet is linked with an electric strike, and it’s activated and de-activated by the electronic door access device. Also included is an access control panel which connects all of the card readers and keyless locks along with an access control server that acts as the ‘brain’ of the system. When you’re looking to improve the safety and security of your home, business, or organization in Newtown Square, PA, call our mobile security system experts today. We’re the only fully licensed, registered, and insured mobile locksmiths in Delaware County, PA, and we take pride in our honest, up-front pricing and quality services. Whether you need new locks for your doors, want to upgrade to an electronic access and locking system for your school, or require a comprehensive video surveillance system for your home or commercial property, call us here at Access Key Service. When You Need A Locksmith Anywhere In Newtown Square, PA, Brookhaven, PA, and the Surrounding Area You Can Count On Lightning Locksmith Every Time. Get the lock and key assistance you need in a flash from us. When you have a job that requires a professional locksmith, call Lightning Locksmith. We've been serving Delaware County PA and the surrounding areas for over 40 years. Business Hours: 24/7 — Call us for 24-Hour Emergency Service!